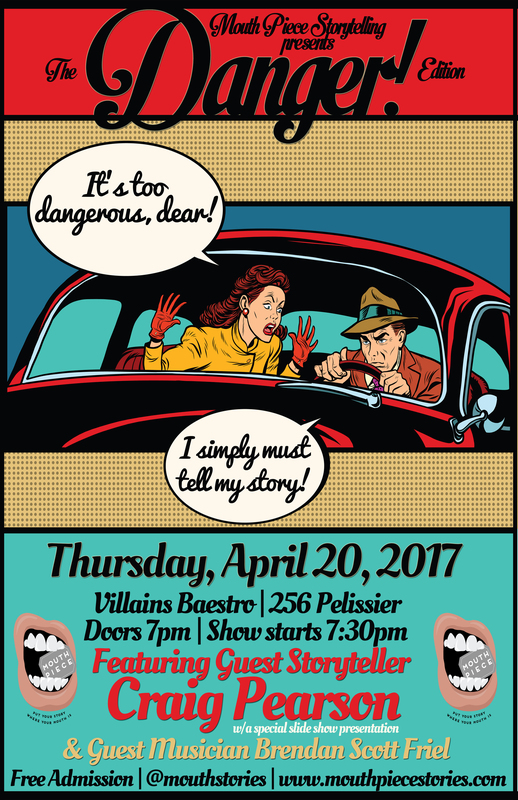 Mouth Piece Storytelling – The Danger Edition This Thursday! THURSDAY, APRIL 20, 2017 – THE DANGER EDITION! FEATURING SPECIAL PRESENTATION BY GUEST STORYTELLER CRAIG PEARSON! MUSICAL GUEST BRENDAN SCOTT FRIEL PLAYING MUSIC FROM HIS NEW ALBUM ‘QUIET CARS’! FREE – ‘CUZ SHARING STORIES IS A GIFT! ARRIVE ALIVE – IT’S A DANGEROUS WORLD OUT THERE!